TUCSON, Ariz.— The Center for Biological Diversity released new video today of a wild jaguar currently living in the United States, named “Sombra” by students of the Paulo Freire Freedom School in Tucson. 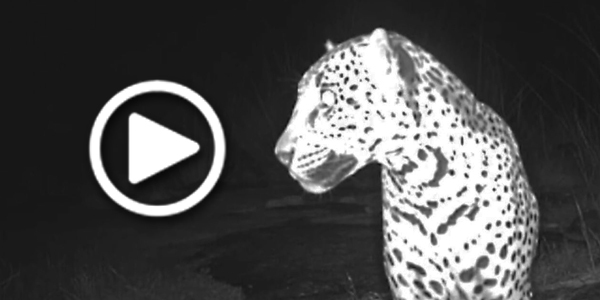 Captured on remote sensor cameras in the Chiricahua Mountains of southern Arizona, the footage shows what appears to be the same jaguar photographed in the nearby Dos Cabezas Mountains in November 2016. The footage, shot this summer, is the first publicly released video of this jaguar. Individual jaguars’ spot patterns are unique, and biologists have compared the photographic evidence to determine that this is the same cat that was photographed last year by a camera maintained by the Bureau of Land Management. The jaguar named “El Jefe” by Tucson middle school students was photographed by trail cameras more than 100 times in the Santa Rita Mountains near Tucson between 2012 and 2015. Video footage of El Jefe released in February 2016 went viral and was seen by millions of people around the globe. A male jaguar, named “Yo’ko” by students at Hiaki High School on the Pascua Yaqui reservation, has been photographed repeatedly between December 2016 and May 2017 by trail cameras in the Huachuca Mountains in southern Arizona. Yo’ko appears to have established a territory on the Fort Huachuca military reservation. “Sombra,” which is Spanish for “shadow,” is the third U.S. jaguar detected in the past three years, originally photographed in November 2016 in the Dos Cabezas Mountains just north of the Chiricahuas. If it’s female, it would be the first one documented in the U.S. since the last known female was shot in 1963 in Arizona’s Mogollon Rim, hundreds of miles north of the border. Jaguars are the third-largest cats in the world after tigers and lions. They once lived throughout the American Southwest, with historical records on the South Rim of the Grand Canyon, the mountains of Southern California and as far east as Louisiana. Jaguars virtually disappeared from this part of their range over the past 150 years, primarily due to hunting, habitat loss and U.S. government-sponsored predator eradication programs intended to benefit the livestock industry. In 2014 the Center secured more than 750,000 acres of federally protected critical habitat for U.S. jaguar recovery. Today’s new jaguar footage was captured well outside of that designated area. The Center has mapped millions of acres of U.S. habitat suitable for jaguars. The video is available for media to embed and use on our or Facebook page or for download.